Sheela raised this question as we both scuttled for a seat in the crowded Delhi Metro. The one hour commute between Rajiv Chowk and Huda City Centre gave us enough time to share tidbits of our daily lives. “Of course you should”, I said. “Girls are leaving a mark in every field these days. Opportunities are aplenty and there should be no restrictions on the basis of gender”. “I thought so too”, said Sheela. “But off late I have begun to realize 100% gender equality is utopian and does not exist”. I was stumped to hear this from Sheela. I have always known her as an intelligent, well read and well-spoken person. An efficient mom of two kids and a feminist at times, she spoke vehemently about empowerment of women on many an occasion. But a statement such as this threw me aback. Sheela continued without waiting for me to ask for a clarification. “I grew up with two elder brothers. So tools, spanners and screw drivers co-existed among dolls, ribbons and laces in my room. My father always made me believe that there is nothing a girl cannot do that a boy can. And I believed this with all my heart and excelled in every activity as a student. My first jolt however came, at the time of my college admission. I cracked the IIT-JEE with a fairly high rank. As my passion lay in tools and machinery, I decided to opt for the mechanical branch. And that is when, for the first time, my “progressive” thinking father questioned my decision. “Girls seldom opt for mechanical engineering. It is a boy’s subject. Why don’t you opt for electronics or computer science instead?” he said. I was surprised at my father’s words. He knew the workshop floor was my passion. Yet he restricted me from opting for it. Nevertheless after considerable coaxing he agreed. So there I was at IIT Delhi. In a class room of almost a hundred odd students I was one among 4 girls. Yes, that was the ratio 4:100 in mechanical engineering. But this did not deter me. I topped my semesters almost every single time. The second jolt of my life came at the time of placements. The engineering based industries which were on campus for placements, did not prefer to employ girls. Though this wasn’t communicated directly, the industries claimed there would be a lot of field work and such an environment isn’t at present conducive for a women employee. So despite being a topper, I could not get a job that I really had the passion for. I did manage to get recruited by a software company based in the USA, which made me forget my actual passion. But the biggest jolt came after I got married. Though Ajay was a loving husband and my in-laws caring, I realized after a few years into matrimony that there are unwritten rules and expectations specific to me. For example, the home front is always to be my department. So it is entirely my responsibility to ensure meals are on time, kids have had their tiffin, the laundry was done, the maid comes in, get the groceries, ensure children have done their homework, and do the other odd errands that spring up on a daily basis. Not that I cringe from taking care of home, but wish Ajay would share the load too. Though my in-laws never openly discouraged me from working, yet every time I returned late from work, I was given hostile looks and a frown. It was different when hubby dearie returned home late from work. The thought was…well… he is earning for the family; hence he isn’t really expected to pitch in do the house work. So I try to get home early from work, so that I could cook a decent dinner for the family, plan the next day’s meals and tiffin’s, get the grocery for the home, handle the maid, sit with the children’s homework and yes do the odd errands that suddenly spring up at home. At that moment, the metro screeched to a halt at our destination. As we both gushed out onto the crowded platform, I let my eyes wander around at the sea of women waiting to get in- from young college students to independent office goers. I thought to myself. There are everyday struggles for each one of them. Sheela had a point. There still are gender specific rules, and stereotyped gender roles that prevail in society. Probably it is time we start to teach our young boys about the non-existence of gender differences. In our Indian society, these differences are unfortunately all the more prominent. Thats the way children are brought up, and a significant makeover is going to take ages. Well narrated! Very well written. This is a very important topic indeed. 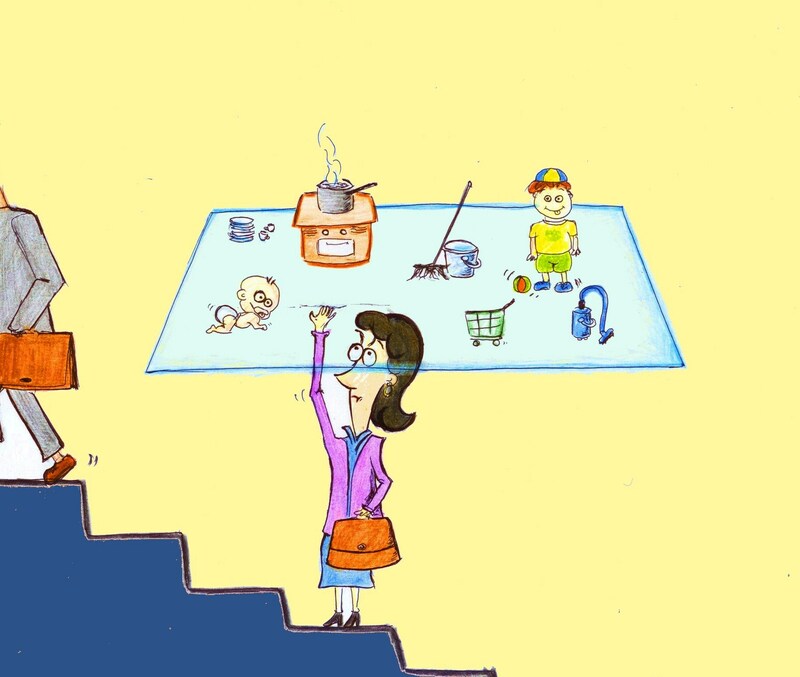 It is high time we treat equality to our kids and stop these gender-specific roles. Unfortunately, it is a long way to go there. In fact, even some of the educated people, including women, argue in favor of gender roles saying that nature has made man and woman in such ways. It is only by spreading the word that we can expect a major change. Blogs is one of the powerful tools for it. I second Sheela’s opinion, having myself gone through a similar career path as hers. Equality is indeed a utopian thinking. I absolutely agree with the suggestion that women empowerment will happen when boys are taught to look at gender roles differently. But then, the same applies to the mothers who bring them up as well! There, of course, is gender discrimination. In some houses it’s very less pronounced, in others the daily routine is made up of inequality and discrimination. Unless we stop these inequalities, however little or big they are, it will never go away. Inequality between the sexes hits home hard for every woman when she experiences any of these set-backs. I think you should teach children that they are of equal importance, but their roles of producing children differ. Once they’re born, both parents can care for them.